Get Your Business on the Right Track. Scale, Grow, Create a Great Culture! The Level 7 System is a one of a kind, simple, straight-forward and step by step approach to building scalable, high performing businesses with engaging and exciting cultures. There is no wingin’ it, random concepts or theories. Level 7 is practical and results focused. The Level 7 System is focuses on execution and ‘getting things done’. Every process has step by step instructions, action plans, templates, guides and tools for easy and fast implementation. In addition to our highly skilled Level 7 Implementation Support Team, engage with like-minded owners and managers actively engaged in Level 7 Implementation. Share ideas and successes while fostering accountability and support. I’ve never seen or experienced any business development program as comprehensive or straight forward as the Level 7 Systems. The program is genius and the result are remarkable. I successful scaled my business while creating a real fun and exciting culture. I reduced the amount of time I spent working while dramatically increasing my income. The Level 7 System is not for wimps. BUT it works! I have confidently and effectively made the transition from being a great real estate agent to becoming a very competent business owner and leader. My income and revenue once was largely dependent on me. Now I am making more money and my business and team is generating a majority of the income. 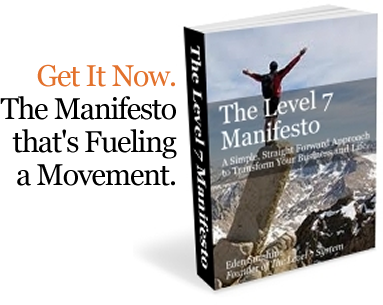 Get your FREE Copy of the Level 7 Manifesto. Learn how to scale and grow your business, build an engaging culture and get more freedom. Experience the Level 7 System first hand for yourself. What better way to see if the Level 7 System is right for your business than to spend 90 minutes with a Level 7 Certified Implementation Specialist absolutely FREE. Discover what Level 7 can do for you and your organization today. Enter your name and email below to receive your FREE copy of the Level 7 Manifesto! Join the movement that is transforming businesses worldwide! Check Your Email Now for the Manifesto.